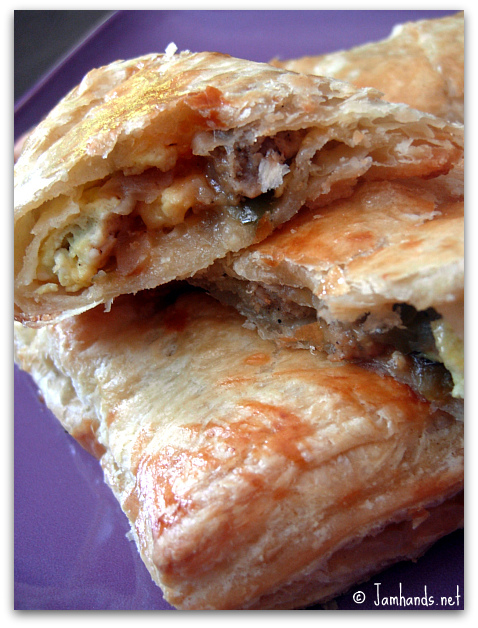 Warm and delicious breakfast turnovers. Ah, they are so darn good. 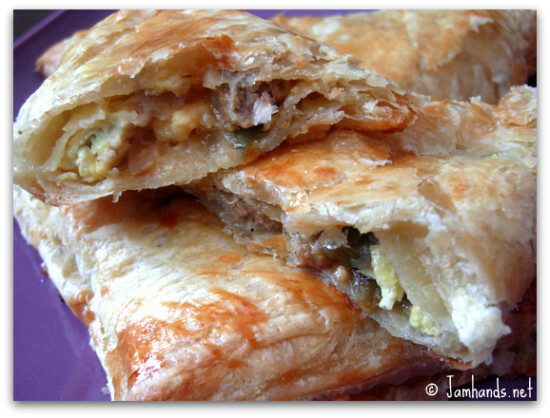 It is wonderful how puff pastry transforms what might normally be a hum drum breakfast scramble into a hand held tasty treat. One tip that I have for cooks who are looking to add more vegetables into their meals is to cook up a big pot of sliced onions and bell peppers until they are soft and the onions are caramelized. Let cool and store it in the fridge. Now they are ready to be added to pasta bakes, quesadillas, and breakfast turnovers like these. I happened to have spicy sausage to use up so I added that in with the vegetables and freshly shredded cheese. So good! Ready for the recipe? There is a lot of room for adapting this recipe to fit your tastes. Like it really spicy? Add sliced jalapenos. Not a fan of sausage? Try ground beef instead. 1. Preheat oven to 400-f degrees. Line a baking sheet with parchment paper. 2. Combine all of the filling ingredients in a bowl and mix together. 3. Lay out the puff pastry sheets. Cut each sheet into squares. I did four big squares per sheet, to make extra big turnovers. You can make them smaller if you'd like. 4. Add filling to squares. Fold over the squares to make a triangle. Using a fork, crimp the edges so they are sealed. Stir up the extra egg in a small bowl then brush the puff pastry with it. 5. Bake for 15-20 minutes, keep a close eye on it, until it is golden brown. Let cool for a few minutes, then remove from pan and serve. Yum! This would make an amazing breakfast (or lunch or dinner!) Great recipe! These look seriously good! Maybe some pieces of hashbrown patties in each one, too. YUM!! @ Erin, Becca & SJerZGirl - Thank you for the compliments :) I think potatoes would be tasty in this as well. Sour cream is a tasty garnish for the breakfast scramble. I wonder how these would freeze/reheat? They look wonderful! I was wondering if anyone did try to freeze and/or reheat these? Because they sounds and look wonderful, and they would be even better if I could make them ahead for those super busy mornings! This will be fantastic for my 2 year old grands sons sounds amazing cant wait to make it!! !